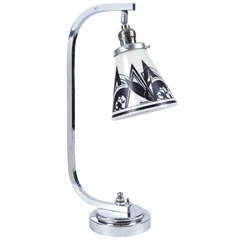 Important Art Deco Gale Turnbull for Leigh Potters table lamp, circa 1929, Leigh art ware Uncommon example of the early American streamline skyscraper design motif in bulbous form. Original tag, rare Mulberry glaze. Model #7. Some wear to brown enamel on shaft and sockets. Untested, finial missing (if any). Ceramic base alone 9.5" tall. Daniel Gale Turnbull, American art-school-trained artist of some renown working in oils and watercolor In France up to 1927, was hired in 1929 by Charles "Leigh" Sebring (Frank Sebring family of potters in Ohio) to design for Leigh a few dramatic new lines. His first and foremost design was this line of Leigh art ware, on the Classic "umbertone" base developed by his predecessor Palin Thorley in 1928 (after having been brought to Leigh from Wedgwood). By 1934, Leigh Potters had closed, facing stiff competition from Cowan and the European Modernists; Clarice Cliff, Susie Cooper, Keith Murray and Jean Luce. Similarity with some jazz - age music-related Ruth Reeves / Donald Deskey themes in this line as well. There are no, more progressive, known examples of early Modernist American earthenware with architecture & cubist art designs than this line, much rarer than Victor Schreckengost's work for Cowan. Two pieces in the Dallas Museum of Art collection; search on-line and also see page 360, "China and Glass in America, 1880-1980," Venable, et al, DMA. Possibly one piece in the Cleveland Museum collection. Turnbull was also co-designer, with Rockwell Kent, of the Classic "Our America" series by Vernon Kilns. See also: Columbus Museum of Art 2005 exhibition 'Bringing Modernism Home: Ohio Decorative Arts, 1890-1960.' for an example of "Manhattan Skylines" for Leigh Potters of Alliance, Ohio, circa 1929-1930. Art Deco table lamp, circa 1930, metal and glass, perfect on a pedestal (cf 2nd photo) Measure: Diameter 35cm Diameter base 24cm.